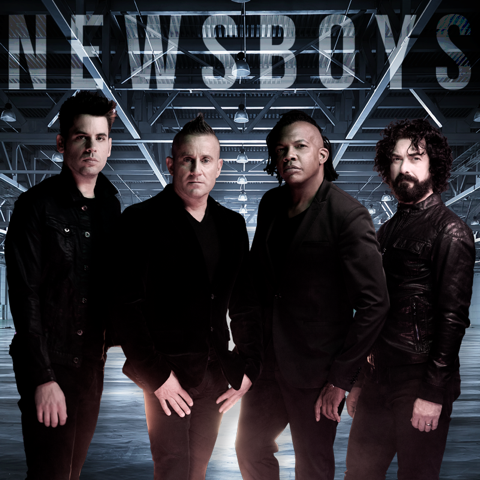 NASHVILLE, Tenn.— GRAMMY®-nominated, Platinum®-selling mega group Newsboys have added eight December dates to this fall’s “Love Riot Tour,” it was announced today. Promoted by Premier Productions, the December leg of the tour will feature pop/rock hitmakers Hawk Nelson and GRAMMY®-nominated singer/songwriter Ryan Stevenson. Also introducing hip/hop recording artist Graham Saber, the evening will include a special message from acclaimed author and speaker Bob Lenz. In December, the "Love Riot Tour" will visit Green Bay, Wisconsin’s Brown County Veterans Memorial Arena; Louisiana’s Baton Rouge River Center; and the Marina Civic Center in Panama City, Florida, among other cities, before concluding at the U.S. Cellular Center in Cedar Rapids, Iowa, on December 11. Sponsored by ChildFund and IF 7:14, the "Love Riot Tour" kicks off September 15 in Williamsport, Pennsylvania. Hitting more than 40 cities through November, the fall lineup will feature Newsboys, The Afters, Ryan Stevenson, Graham Saber and Bob Lenz. Newsboys’ multi chart-topping 2016 release, Love Riot, was recently nominated for a Gospel Music Association Dove Award for Pop/Contemporary Album of the Year, while Travis Ryan, Richie Fike and Matt Hooper, writers of the band’s blockbuster #1 hit, “We Believe,” received a nod for Worship Song of the Year. In addition, the PureFlix box office sequel, “God’s Not Dead 2,” which features Newsboys, was nominated for a Dove Award for Inspirational film of the Year. Helping define the sound of Christian music for more than two decades, Newsboys’ live performances—including their “We Believe…God’s Not Dead” 2015-2016 Tour—continue to sell out venues across the country. Comprised of lead vocalist Michael Tait, Jody Davis (guitar), Jeff Frankenstein (keys) and Duncan Phillips (drums), the band has sold more than 8 million units, amassing eight Gold® certifications, 33 #1 radio hits, four GRAMMY® nominations, two American Music Award nominations and multiple Dove Awards. “God’s Not Dead,” Newsboys’ chart-topping, Platinum®-certified single, inspired the eponymous Pure Flix 2014 hit film. Hawk Nelson (FairTrade Services) has won the hearts of thousands since its debut release in 2004. This powerhouse, pop rock band has released seven studio projects (Letters to the President, Smile It’s the End of the World, Hawk Nelson is My Friend, Live Life Loud, Crazy Love, Made and Diamonds). Their most recent release, Diamonds, produced the No. 1 radio single with "Drops In The Ocean,” where it spent nine weeks at the top of Billboard's Christian AC Indicator chart. Hawk Nelson has been awarded two Canadian GMA awards, multiple GMA Dove Award nominations as well as a JUNO nomination. The band's music has been featured on NBC, MTV, WB, WGN, KTLA, Nickelodeon and the NFL Network. Their music has been used with special promotions for "American Idol," the NFL, Nike, JCPenney, Olympics, NHL and Michelle Obama's "Big Day Out" 2011 campaign. GRAMMY®-nominated Gotee recording artist Ryan Stevenson’s full-length debut, Fresh Start, released to critical acclaim last year and features the current multi-week radio smash, “Eye of the Storm (feat. GabeReal).” The project also includes the #1 hit “Not Forgotten (feat. TobyMac)" and the previous single, “All Yours.” Stevenson, who was nominated for a 2014 GRAMMY® Award as co-writer of TobyMac’s hit single “Speak Life,” spent seven years as a paramedic before signing an exclusive agreement with Gotee Records. He hails from the Pacific Northwest and is a husband and father of two boys. Bob Lenz speaks to nearly half a million teens and adults across North America each year through school assembly programs and faith-based outreaches and events. Founder and president of Life! Promotions, a non-profit organization with a mission to instill hope in youth, Lenz is the author of Dignity Revolution – Standing Up for the Value of Every Person and Grace – For Those Who Think They Don't Measure Up.